Renovation to the interior of the kitchen, dining room, master bedroom and washroom of an existing two story home built in 1920. Addition of a new master bedroom ensuite washroom, outdoor balcony, breakfast area, rear entry, mudroom, siting room and mechanical system. maximizing views of the rear yard. The owners of 308 Fifth Avenue set out to turn a modest Glebe house into a home able to accommodate a social lifestyle and a future family. The transformation of the building was driven initially by a desire to replace a kitchen and breakfast area; the work of a weekend warrior completed approximately thirty years ago. The visionary clients with high expectations expanded the scope of the work to include the remainder of the home, allowing a holistic approach to the renovation’s design and a comprehensive renewal of the building and its systems. Collaboration throughout the project between the clients, the designer and the builder was critical to this project’s success. The design successfully transformed a dark and divided barn-like building into a contemporary dwelling by carefully opening the existing spaces, and adding new places to satisfy the needs of a professional couple. Southern views toward mature deciduous trees through expanses of south facing glass extend the interior into the rear yard. A new rear entry room at grade with extra hight ceiling provides ample storage while facilitating movement between floors. Enhanced associations between the dining room, kitchen and a new sitting area readies the main floor for guests. The master bedroom with new ensuite bathroom, new private balcony and new desk/crib nook adds value with luxe to a room formerly reserved for sleeping. The antiquated HVAC system was replaced with a state of the art cold climate heat pump that operated efficiently down to -25 throughout its first winter. The zoned air to air system provides both heating and cooling, supported by an integrated HRV. The system’s ongoing performance is monitored by NRCan. Improvements to the home’s envelope included new triple pane windows and doors throughout, extensive reinsulation on all exterior surfaces coupled with careful air sealing guarantees that investment in the mechanical system is not lost. Future proofing the building, through initiatives like mechanical room to attic conduits to simplify photovoltaic generation system installation, prepares for later phases of investment. 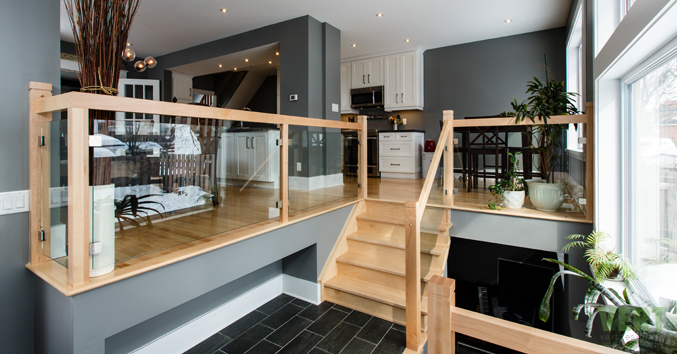 This project was awarded the Greater Ottawa Home Builder’s Association Green Renovation of the Year Award in 2014.